As you’ve read in my bio, I used to be a dancer, a dance teacher, and a choreographer. I loved all those roles, and I miss them. Oh, don’t get me wrong, I love being a writer. But Christmastime was always so special at my dance school. Before the holidays—around October, the studio would sell hoodies, dance bags, and T-shirts with the dance school logo embroidered on them—most of the girls would have their names added as well. Oftentimes, the moms would pull me aside and ask to have their daughter’s order set aside—intending to give the hoodie or T-shirt as a Christmas gift. Even though I had my own family, when Christmas day slowed down to a purr, I would find myself thinking about the girls from my dance school who had received the dance merchandise as gifts from their parents. Somehow it made me feel warm inside to know that my dance stuff was under Christmas trees throughout the tristate area (PA, OH, and WV). I felt good that I had something to offer that people would find worthy to give as a Christmas gift. And when the Christmas break was over, the girls would come bounding into the dance school proudly sporting their new dance gear. Truly fun times. Those days are gone, but they have been replaced by the knowledge that people are now giving my books as gifts. Now on Christmas morning I know that somewhere—well beyond the tristate borders, someone is receiving one or more of my books under the tree or in a stocking. I imagine them finding a cozy quiet place after Christmas day has settled down. Perhaps in a chair close to a crackling fire they study the cover, read the dedication, the inspirational quote that lies within the first few pages, and then they turn to the prologue to let the adventure begin. Yeah, I still get that warm feeling inside knowing that my writing stuff can be found under Christmas trees. *Sigh* I still have something to offer on Christmas morning, and for that I am truly blessed. I hope your Christmas season is filled with joy and 2017 brings peace and good health. 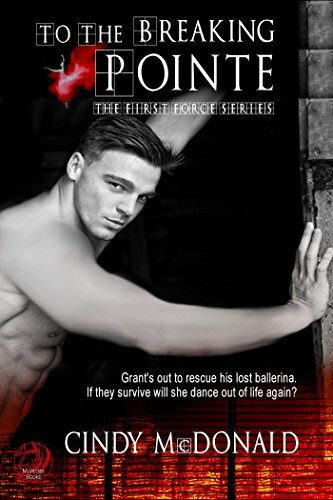 Five years ago, First Force operative Grant Ketchum let the ballerina of his dreams dance right out of his life. After her American adoptive parents had been killed in an automobile accident, Silja Ramsay returned to her birthplace, Russia, to take the position of the principal dancer for the Novikov Ballet Company. She was living her dreams, and although they had very little contact, Grant was proud of her. The owner and director of the ballet company, Natalia Novikov, has a dark secret: her beloved ballet company is almost broke. Natalia has become so desperate for funds to keep the company afloat that she’s forced her dancers to prostitute themselves to financial contributors at exclusive after-show parties. Now Grant Ketchum is on a mission to find his lost ballerina and rescue her from this powerful man’s subjugation. He will do anything to get her out alive. If they survive, will he let her chasse out of his life again? Cindy is a huge fan of romantic suspense series’, especially with a military ops theme. Although she isn’t one to make New Year’s resolutions, on New Year’s Day 2013 she made a commitment to write one. At this time, there are four books in her black ops series, First Force: Into the Crossfire, To the Breaking Pointe, Into the Dark., and To the Brink. Book number five Into the Dawn is scheduled to release in September of 2017. Cindy resides on her forty-five acre Thoroughbred farm with her husband, Bill and her Cocker Spaniel, Allister near Pittsburgh, Pennsylvania. I am very glad that you are offering me something for the peaceful days after the chaos of the holidays!!! :) I CANNOT wait to read this book!!! !